Alberobello will be celebrating two fantastic events back-to-back over 4 days, starting 30th April. The first event is to celebrate the 2nd edition of UNESCO IN JAZZ FESTIVAL, an international festival devoted to Jazz as part of UNESCO International Day. Alberobello trulli were recognised by UNESCO in 1996 for their unique architecture and outstanding beautiful. The second event is a 3 day celebration LOVIN’ PUGLIA Spring 2015 containing a rich and varied program of folkloric events, music, pageants and crafts, to enliven the City of Trulli. UNESCO IN JAZZ FESTIVAL Fabrizio Bosso Spiritual Trio with Fabrizio Bosso the trumpet, Alberto Marsico hammond organ, Alessandro Minetto the drums. City Folk Group of trulli of Alberobello and Stable Company with entertainment and popular folk re-enactment ancient crafts through the streets of the Monti and largo Martellotta. Afternoon: City Folk Group of trulli of Alberobello and Stable Company with entertainment and popular folk re-enactment ancient crafts through the streets of the Monti and largo Martellotta. TALENTED ARTIST APULIAN showcasing ‘P.d’a. & Monotipi’ Maurizio Sic Muolo and ‘Playlist Illustrata’ Gianvito Turi. CANTASTORIE – stories about the origins of Alberobello with Giulia Colucci and Bale Bulatovic. APERI-SHORT – selection of short films by directors from Pulia by Nocicortinfestival. Domenico Modugno with Maria Giaquinto (singer), Fabrizio Piepoli (singer, accordion, bass guitar), Adolfo La Volpe (Portuguese guitar, oud, electric guitar), Giuseppe De Tritium (classical guitar), Francesco De Palma (percussion, drums). In the morning, at Largo Martellotta: representation of the ancient work in the farmyard with entertainment and folk reminiscent Arteca by the association. Afternoon and evening Largo Martellotta: representation of the ancient work in the farmyard with entertainment and folk reminiscent Arteca by the association. Live music with Francesco Mastrangelo, voice and acoustic guitar; Pepe Laterza, voice and mandolin; Cristian Abbattista, bass and double bass; Francis White, drums and percussion; Gianni Pinto, electric guitar. TALENTED ARTIST APULIAN showcasing ‘P.d’a. & Monotipi’ di Maurizio Sic Muolo e ‘Playlist Illustrata’ di Gianvito Turi. Excellence in Puglia with music ALEX WHEREOF, dj producer and music critic. Reggae, hip hop, nu-jazz, funk. Reggae, hip hop, funk, rock with the historian and DJ Alex Of This. Showcasing ‘P.d’a. & Monotipi’ di Maurizio Sic Muolo e ‘Playlist Illustrata’ di Gianvito Turi. FARINELLA PALADIN AND THE STORIES OF TRULLO with Dino Parrotta and Enrico Castellaneta. By FIRST THEATRE. 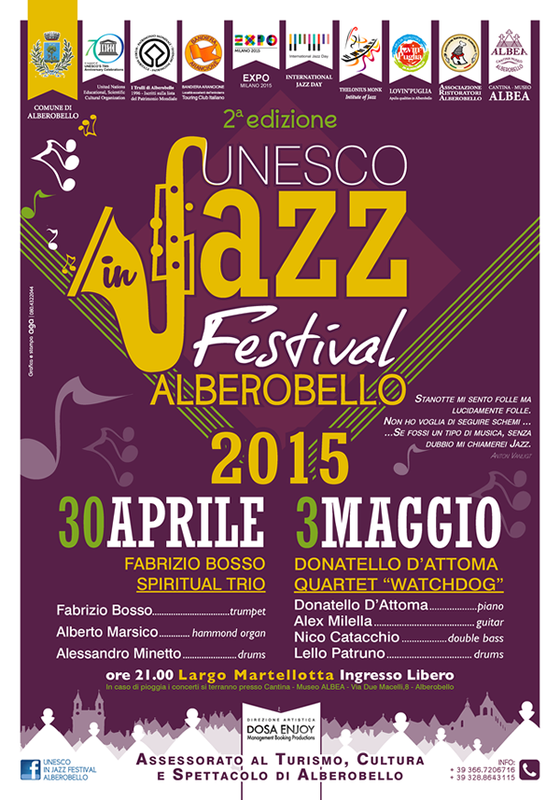 UNESCO IN JAZZ FESTIVAL concert Donatello D’Attoma Quartet ‘Watchdog with Donatello D’Attoma floor, Mirella Alex the guitar, Nico Catacchio the double bass, the drums Lello Patruno. The rich program is organized by the City of Alberobello with the collaboration of the Association of Young Hoteliers Tourism (AGIT with Restaurateurs Association), and also Asshotel, Cellars Albea, traders and craftsmen, Little Shop Popolare, G-Lan, Faber City Cooperative Community of Alberobello, Cooperativa Agricola Ortofrutticola Alberobellese, Folk Group City of Trulli, Association Arteca, Stable Company of Alberobello, Sylva Tour and Didactic, Pro Loco.